Lesser Scaup Watercolor Sketch – Let's Paint Nature! While at Lake Katherine a while ago, I noticed some ducks that looked like loons from far away. I knew they weren’t loons, so I took a picture intending on looking it up later. Wouldn’t you know it, my memory card was NOT in my camera and since the cord is long gone…getting that picture out is not happening. Later that day while inside the nature center, Lake Katherine just happened to have a poster on their wall with this guy’s picture! 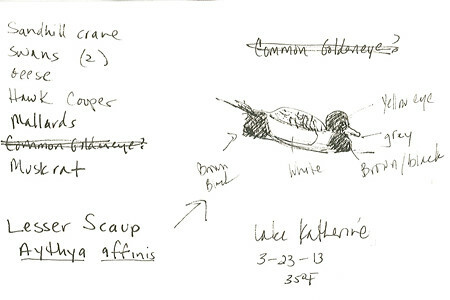 Yessss…identification made…the Lesser Scaup. I made this sketch at home after looking at several pictures. The REAL sketch on location is not nearly as impressive…. Here’s the real deal. A quick scribbly mess. They just don’t stay still when asked. 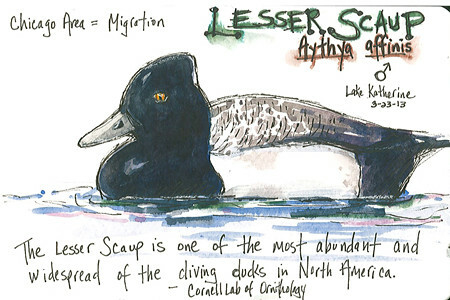 The Lesser Scaup is a diver. When feeding, his whole body dives below the water and he’s MIA for quite sometime, later popping up a few feet away. Never where you expect him to…haha. Not a lackadaisical, carefree dive as in a pastime hobby, no, a powerful, quick, forceful dive to survive, to gather food. A very purposeful intent for existence. I too need to take this same intense dive to propel me to the next level in life. It’s game time. I’m at a point in my life where everything is turned upside-down and I can float into the dangerous current or I can forcefully dive for the goal. I pick the plunge over the float. With God’s help, I will get there. It might be slightly uncomfortable at first, but always in my best interest for the long run. I guess you can say it’s my lesson from nature. That’s what I love about this passion for art and nature! It makes me so happy, I can jump up and down! The things I learn are priceless. I was there at Lake Katherine and I would say that is an excellent sketch! You nailed it Christine! As for diving, I’m the kind of person who wants to go deep and not just skim the surface – live superficially — you instinctively know that diving deep is the only way to live, not just exist like most people do. Thanks Alanna! That was fun wasn’t it?